There is a school of thought that considers canned foods to be a compromise, trading quality for convenience. That's not always true. 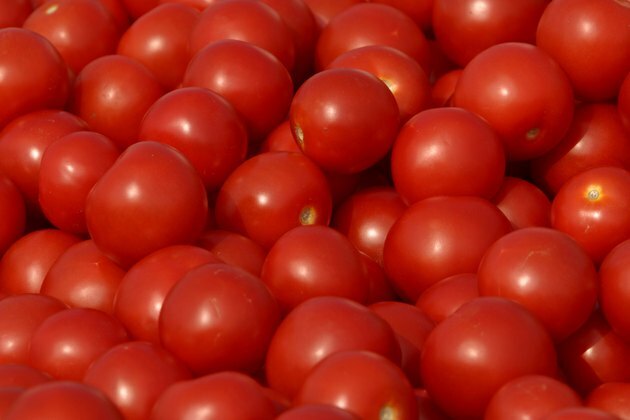 With tomatoes, for example, the "fresh" tomatoes available for much of the year are hard and flavorless, bred and picked purely for their storage characteristics. In contrast, canned tomatoes are usually picked when ripe or nearly ripe, then processed almost immediately in a nearby factory. Their quality is consistent and their flavor is usually better than supermarket tomatoes. However, if it's tomato season where you live, by all means substitute fresh for the canned. Canned diced tomatoes are a modern, convenient version of a traditional preparation used in commercial kitchens. Generations of French chefs have kept their apprentices' hands busy for hours, making up batches of tomatoes "concassee." These are tomatoes that have been prepared for use in recipes by skinning them, removing the watery pulp and seeds, and dicing the flesh into uniform pieces that will cook evenly, turning slowly into a smooth sauce as their cell walls break down and the excess moisture evaporates. Opening a can might be easier, but you can prepare your own fresh tomatoes with little effort. The first step in preparing your tomatoes is skinning them. There are peelers designed especially to do this job, but really ripe tomatoes might not cooperate. It's easier to blanch them in boiling water. Core your tomatoes at the stem end, then cut a small "X" in the bottom with a paring knife. Drop the tomatoes a few at a time into boiling water for 30 to 60 seconds, then transfer them to a bowl of ice water. Once they're cooled, the skins will slip off the tomatoes with a minimum of fuss. Cut each tomato across its midsection, so you can plainly see the pattern of seeds and flesh in the middle. Squeeze each half gently to remove most of the seeds and watery pulp, the remove the rest with a finger or a small spoon. If your recipe calls for the juice of the tomatoes, squeeze out the pulp into a colander over a bowl and save the juices. Place the tomatoes on a cutting board and dice them into 1/4-inch or 1/2-inch pieces, as desired. Use these in your recipes, and set aside any excess to freeze or can. If you're cooking down your tomatoes to make sauce, you might not be worried about precise quantities. However, if you're working from a written recipe, it probably calls for a specific quantity of tomatoes. Most brands come in 14-ounce and 28-ounce sizes, slightly less than 2 and 4 cups, respectively. To replace a 14-ounce can of tomatoes, spoon diced tomatoes loosely into a 2-cup measuring cup until they reach the 1 3/4 cup mark. Add enough of your reserved tomato juices, if called for, to cover the tomatoes. If your recipe calls for a 28-ounce can, do this twice.